Should Christians Support The Death Penalty For Murder? Is capital punishment Biblical? Christians believe in the perfect love God has for everyone regardless of what they have done. Some Christians believe the death penalty contradicts this law of love, others stand firmly in support of capital punishment. This capital punishment article looks at the question: Should Christians support the death penalty or not? In searching for the answers to today's tough questions we must return to the beginning. Unless we understand and accept the foundation, the building will confuse us. We must begin by realizing God is the Creator. God, as revealed in the Bible, is our Foundation for everything. He not only designed the entire universe, but He designed mankind as a special creature capable of having genuine fellowship with Himself. Since God is the Creator of mankind, He owns all men [Christians and non-Christians]. As the sole Originator and Maintainer of all life, it follows, that He alone can dictate how life should be lived and how, if ever, it should be taken. If capital punishment is legitimate, then it must be authorized by God. He must also lay down the guidelines for how and when capital punishment is to be used. If such guidelines do not exist in the Bible then the Death Penalty is but a fancy name for murder. However, if they do exist then people, including Christians, who object to capital punishment within the guidelines are judging God and making themselves greater and wiser than God. So our big question in this Capital Punishment article is: What does the Bible teach on capital punishment? We will begin in the Old Testament. For those who believe the Old Testament laws have been replaced by the New Testament, bear with me or read Is Biblical Law Valid Today?]. After we have seen the Old Testament teaching we will turn to the New Testament. In the instructions God gave Noah right after the flood, He mentioned capital punishment. "Surely for your lifeblood I will demand a reckoning; from the hand of every beast I will require it, and from the hand of man. From the hand of every man's brother I will require the life of man. Whoever sheds man's blood, by man his blood shall be shed." [Gen. 9:5-6, NKJV] God made His intentions pretty plain. Whoever killed a human being, whether is was a human or an animal, was to face capital punishment. "He who strikes a man so that he dies shall surely be put to death. But if he did not lie in wait, but God delivered him into his hand, then I will appoint for you a place where he may flee. But if a man acts with premeditation against his neighbour, to kill him with guile, you shall take him from My altar, that he may die." [Ex. 21:12-14, NKJV] Here we see a qualification. If the death was an accident [manslaughter] the killer was not necessarily "off the hook," but he did not face capital punishment. If it was premeditated murder, the killer was to be put to death without exception. It is important to note it takes more than one witness [although the witness does not necessarily have to be a human witness] to obtain a capital conviction. This is to protect against accidentally taking an innocent life. The murderer must be proven guilty, but if he is, then Old Testament Law demands he face capital punishment. An exception to this law is self-defense. "If the thief is found breaking in, and he is struck so that he dies, there shall be no guilt for his bloodshed. If the sun has risen on him, there shall be guilt for his bloodshed." [Ex. 22:2-3, NKJV] If someone is caught in the act of attacking a victim or of theft and is killed, it is not considered murder and the killer is not punished. He was acting in self-defense - this means it is Biblically legal to use lethal force in defending your property as well as yourself and others. However, if the victim knows who stole from him, hunts him down and kills him after the fact, that is murder and deserves capital punishment. After the fact, the accused must be brought before a proper court of law. But what about the Sixth Commandment? It says, "Thou shalt not kill." [Ex. 20:13, KJV] The word in the Hebrew language literally means "to dash in pieces." In the NKJV, the Amp., the NIV, and the NAS versions of the Bible this verse is translated, "You shall not murder." This puts the commandment in its proper light. Murder is the premeditated taking of human life outside the guidelines set by the Creator and Owner of Life. From the previous verses we see Capital Punishment for murder is commanded by God and; therefore, is not murder nor does it violate the Sixth Commandment. What about Cain? He committed murder and was not put to death. Why wasn't Capital Punishment enforced then? The duty to enforce the Death Penalty falls on the Civil Government. No one else is given that responsibility. In Cain's case, everyone alive was his immediate relative. While the family unit is responsible to report criminal acts committed by family members, they were not the ones to carry out the Death Penalty. When Cain committed the first murder there was no one qualified to be the executioner so God punished him differently. Fine, how about David? There were a lot of people in the world who were not his immediate relatives when he committed premeditated murder and yet he was not put to death. Why not? David was the king of Israel. As mentioned above, it is the responsibility of the government to carry out Capital Punishment and David was the highest official of government. Does that mean he was above the law? No, but we do have a problem. It was not a democracy, and who is going to carry out a death sentence against a king? However, David did not escape punishment: among other things, his new born son died - an innocent life for his guilty act. In both these cases there were fundamental legal principles which God considered to be more important than the capital punishment. [It was two very rare exceptions.] 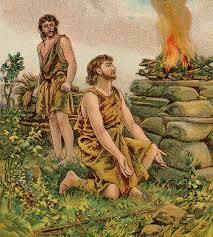 It was not that Cain and David did not deserve to die [they did], but a more important issue was at stake. Although God allowed them to escape the death sentence, they were both severely punished. As we turn to the New Testament we must remember there are some differences between the two Testaments. Both Testaments focus on the Person and work of the Lord Jesus Christ. However, in the beginning of the Old Testament Israel became a nation. They needed to know how God expected a national, civil government to operate. Many of the laws of the Old Testament explain just that. When we come to New Testament times, the Jews were no longer in control of the civil government. They were under the Romans. Since all the laws and principles needed for a civil government to operate according to God's plan were already revealed, there was no need to repeat them in the New Testament. Instead, the New Testament deals with spiritual Israel - the church. God still demands that civil governments rule according to His laws, one of which is putting to death murderers. Jesus quoted the Sixth Commandment in Matt. 19:18 and in Luke 18:20. He quoted it, showing it was still in force, and made no reference to any change in punishment. If there had been such a change, Jesus or the Apostles would have said so, but they didn't. How can putting someone to death be justified with love? The first thing it shows is love for God and His law-word. God's law, like Himself, is perfect and holy. We express our love for God by keeping His law. "For this is the love of God, that we keep His commandments. And His commandments are not burdensome." [1 John 5:3, NKJV] As we have seen, part of that law requires capital punishment for murder. The second thing we show is love for the victim, the victim's family, and all future potential victims and their families. If a family has had an innocent life taken from them, the ONLY God-given way to bring justice on behalf of God and the family is for the killer to die. This also shows love for all potential victims. How many innocent people have been murdered because of repeat offenders who should have been put to death the first time. There should be no opportunity for repeat murder offenses. [Some of you will be upset by this, but I'm sure you noticed that the punishment is the same regardless of the age of the criminal - that's right no juvenile court. God focuses on the victim not the criminal.] We cannot be merciful to both the criminal and the victim. We must choose one or the other. God always rules in favor of the victim. Polluted or watered-down justice sends the message that God is not really righteous or holy. It makes people think that sin isn't all that bad, although the Father had to sacrifice His Son in order to redeem us. We must never take sin lightly. The eternal scars across the body of Jesus will forever remind us of the dreadfulness of sin and the love that paid it's price. We need to re-emphasize that the responsibility for carrying out capital punishment is given to the civil government after a properly conducted public trial [the executions are to be public also]. It is never to be done on the whim of individuals nor is it to be carried out by the church. The church is to teach the civil government what God requires, but never to take over its responsibilities. Godly men and women should be running both the church and the civil government, but their jobs are different. But what if, like in Canada, the government refuses to carry out its responsibilities, or in the case of the United States, where it does so only in rare cases? Can the church or individuals step in and carry out the just sentence against convicted killers? No. If the civil government fails in its job, no one can take over for it in carrying out capital punishment. The church and individuals should do everything legally in their power to teach and motivate the civil government to do its God-given duty in every area including this one. So great does God view this subject that if capital punishment is not carried out according to His law, He will eventually judge the nation on behalf of its innocent victims. He may use a dramatic rise in violent crime, war, fatal disease, natural disasters, etc. or any combination thereof. But it will come. Innocent blood must be paid for. If we refuse to make the criminals pay for it with their own blood, God will take our blood as payment [Lev. 26:14-39; Matt. 23:34-35; Rev. 6:10]. This paints a bleak picture for the future of Canada [and other nations]. But it need not be so. If we will repent, ask God's forgiveness, and begin to press our leaders to return to Biblical law including capital punishment, all the future pain can be removed. We can come out from under God's judgment and begin, as a nation, to once again enjoy His blessings. The choice is ours. 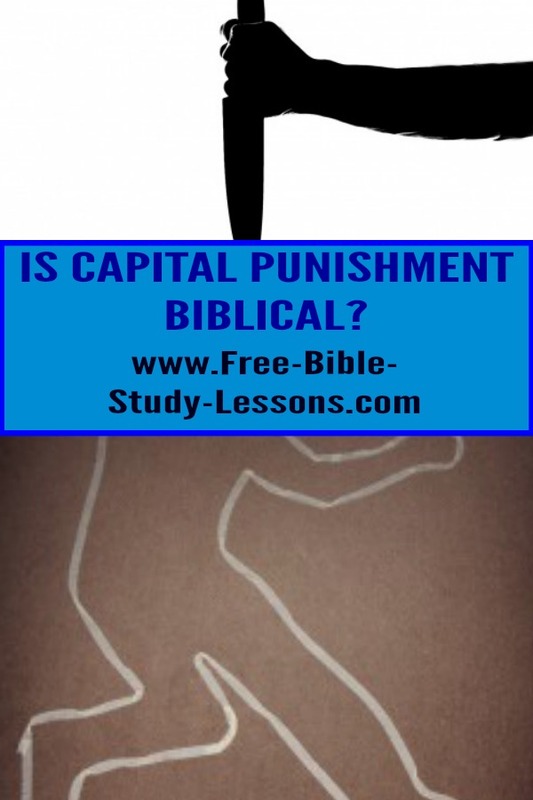 You can research the Bible teaching on capital punishment in the book Institutes of Biblical Law. Your article Capital Punishment for Murderers? raised valid questions, esp whether O.T. Biblical Law should be applied today. Obviously, I do not condone murder. But even in the OT, the Death Penalty was NOT universally applied...to read the rest of the letter and my reply Click here. Your anger against wrongful convictions is just, but it should be directed at a humanistic court system which allows injustice not a Biblically legitimate punishment for genuinely guilty people. There is only one true source of authority in the universe - Jesus Christ. This is also only one impostor - Satan. All authority comes from one of these two sources. When we say that there is to be separation of Church and State it means that the Church as an organization should not rule over the State and the State as an organization should not rule over the Church. However, both in their separate areas of authority are to be under God's rule. To say otherwise is to say that the State is to be under satan's rule and that there are areas of life in which God has no business. No Christian, who understands the Lordship of Christ, would say that. What is truly sick is that murderers - in violation of the Word of God - are allowed to kill again and again or innocent people have their hard-earned money confiscated to provide expensive accommodations for them.